Today I’m serving up breakfast for ya, Vanilla Almond Granola style. Or perhaps you’d rather have this slightly sweet and tempting granola for a snack? Guess what? You can have it both ways! 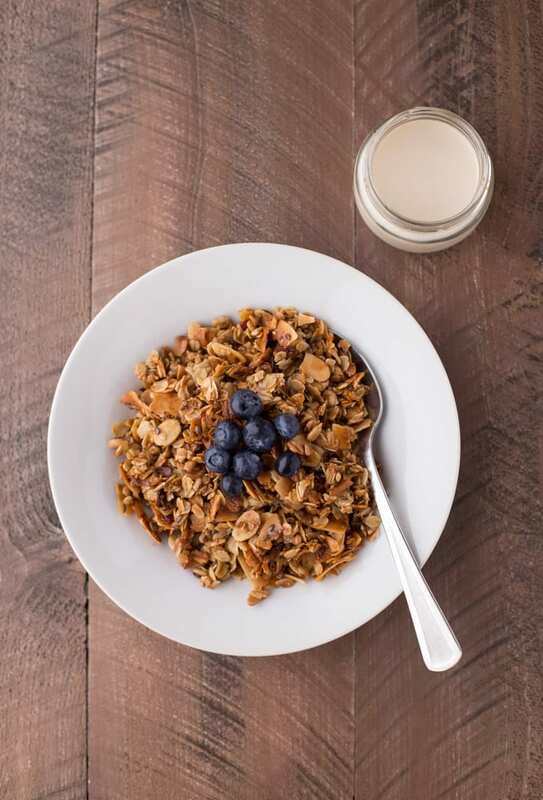 For breakfast, enjoy the granola with almond milk, cereal style. Or enjoy it in a fresh fruit parfait. Next week, I’ll be sharing a Roasted Nectarine Greek Yogurt Parfait that’s filled with this vanilla almond granola. I think you will totally swoon over it! For snacking, pack some of the granola in a small reusable container or a sealable bag and take with you to work, on a shopping trip or on a road trip. Or you can do like I do and just eat it straight from the storage jar. Preheat your oven to 350. Line a baking sheet with foil. Spray lightly with cooking spray. Combine all of the listed ingredients in a large mixing bowl. Mix well. Pour onto the prepared baking sheet and distribute evenly. Bake for 30-35 minutes or until golden. 15 minutes into baking, stir the mixture and then continue to bake for the remaining 15-20 minutes. Pour the granola onto a cool, foil lined surface. Allow the granola to cool completely and then break apart. Adapted from the Better Homes and Gardens New Cookbook, 1996. When the granola is done baking, it will seem soft and sticky. However, as it rests and cools, it will become crunchy. « Previous PostSpiced Lentils with Toasted Coconut + A Baby Shower! I LOVE granola!! And especially when I see coconut oil in the ingredients I get excited to try it. This looks amazing! Can’t wait to try it. I’m one with, the best way to sweeten granola is with pure maple syrup! This is a wonderful recipe! The vanilla, almond and coconut flavors are perfect! 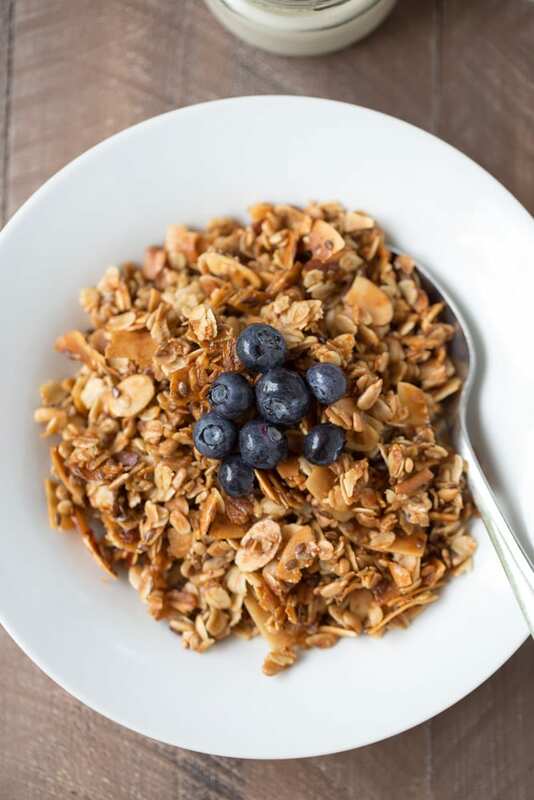 I am obsessed with granola because I love the crunchy texture and could snack on this all day. I almost snacked all of it in one sitting. ;) It’s that darn good! Thank you for stopping by and for the comment, Ashley! 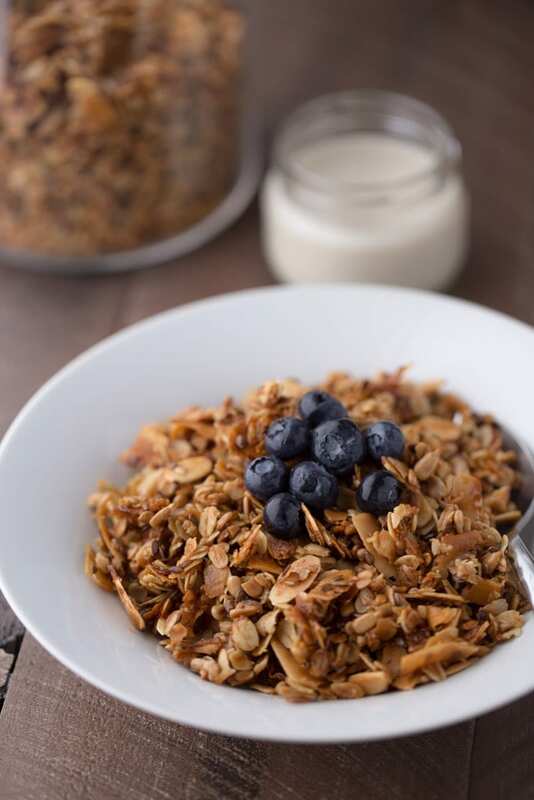 This granola looks extra toasty – my favorite way!! I used to ask for my mom to pick up Trader Joe’s vanilla almond granola every time I came home from college. Love that you can make it homemade! Also so glad I just stumbled upon your blog! I have not had granola in a while, and honestly? vanilla almond? you have me craving it now! I may get up and make this right now, for breakfast parfaits tomorrow! Some of my favorite flavors!! That vanilla with the coconut oil is totally heavenly. I would’t complain about granola 7 days per week either! Thank you for stopping by and commenting, Fareeha! This looks amazing! I have to try this soon, I absolutely love granola. Great pictures by the way!